Focas' base was projected to imitate a wide, Venice-style wardrobe: a simple and effective way to make this piece of furniture be the centre of your rooms. Wooden structure with doors and drawers. Decorative metal chain with leather inserts. (Full extension drawers, inside covered with fabric suede leather effect). Plasma/LCD television set modular unit with body lacquered in vintage white finishing, inner frame in silver leaf finishing, outer frame in silver patinated black lacquer finishing, silver leaf top decoration. 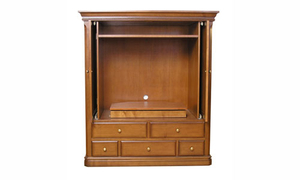 A traditional TV cabinet is characterized by its familiar style, use well-known construction techniques (e.g., wood joinery) and suitability for a number of decorative schemes. On ArchiExpo, this furniture is arranged by properties such as material. These cabinets are normally used at home to organize a television, digital boxes DVD players and other media equipment. Some are glazed or have cupboards, shelving or drawers. Consider how the style, finish, construction and materials will fit with surrounding decor. Determine the type of television and media equipment it will hold, and whether it will be enclosed. Another factor is adaptability to changes in technology such as monitor size and the configuration of associated devices. Shelves may be fixed or adjustable.